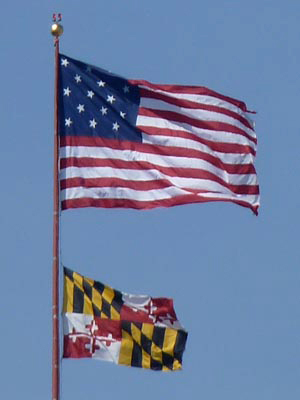 American and Maryland flags flying high over downtown Baltimore. Just why does the American flag have 15 stars and stripes? Think about Baltimore’s Fort McHenry and Francis Scott Key. I resided in Baltimore, Maryland during graduate school at Johns Hopkins University- that was way back in the last century. In 2010 I came back to Baltimore as co-chair of a Geological Society of America meeting held in Charm City, U.S.A. (Baltimore’s nickname born from a ridiculous marketing strategy in the 1970s). Somehow my professional colleagues thought my time in Baltimore made me qualified to chair a meeting and corralled me into the position. Sure, I’d lived in South Baltimore, Hampden, and Roland Park during my Hopkins days, commuted through downtown on MTA buses many times, and watched the Orioles go from Memorial Stadium to Camden Yards, but my knowledge of Baltimore is rather limited. It is my good fortune to be co-chair with Noel Potter, an emeritus professor from Dickinson College. Noel knows the score and organizing a meeting with him was a joy. 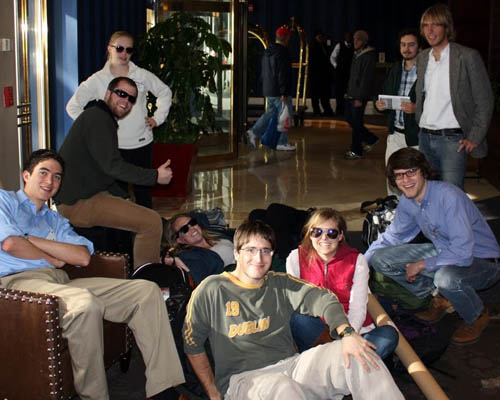 We’d been at it for nearly two years, including multiple trips to Baltimore to line up the hotel and arrange the space; we recruited session leaders, developed a technical program, and advertised the event far and wide (see post of October 20th, 2009). The meeting took place at the Sheraton’s City Center Hotel, curiously a 1991 Geological Society of America meeting met in the same hotel and it was here as a young graduate student I gave one of my first professional talks. Nineteen years on and I was running the show- scary ain’t it? In December we had received a record number of abstracts for the meeting- lots of earth scientists from Texas to Nova Scotia would be coming to Baltimore to deliver talks and posters. In the last month or so we’d worried as to whether we’d have enough space for the expected crowd. The technical program and abstracts can be viewed at http://gsa.confex.com/gsa/2010NE/finalprogram/index.html. The topics were diverse- ranging from asbestos hazards to issues wrapped around energy development in the eastern United States to the consequences of climate change on barrier islands to the piracy of streams in the Appalachian highlands. Attendance at the meeting by both professionals and students set a record (over 1,600 altogether) and by most metrics the meeting was a big success. Left- AJ Saltz and her research poster focused on landscape change in the southern Blue Ridge Mountains. Right- Jonathan Garber showing off his style as he answers question about Shenandoah River watershed. As always the W&M Geology department was well represented. Professors Greg Hancock, Rowan Lockwood, and Ryan Thigpen all convened technical sessions. Twelve undergraduates presented the results of their senior research as posters or talks. Part of the William & Mary Geology crew- all smiles at the end of the Baltimore GSA meeting. Lots of departments and programs at William & Mary offer undergraduates the opportunity to conduct independent research- that is part of what makes W&M a great school. 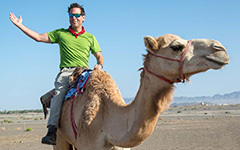 The Geology Department takes it a step further, rather than just presenting to colleagues and professors on campus, geology students are encouraged and supported to take their findings to professional meetings and communicate that science to a larger audience. From my perspective, scientists have a responsibility to communicate their research results, to an array of audiences as well as through a variety of media. If our work is meaningful it must be conveyed clearly and thoughtfully. W&M geology students learn to do just that and these skills serve them well long after they leave Williamsburg. Managing this meeting has been a rush- I’m not sure where the last few days have gone. The W&M students are headed south, back to classes and campus life- I’m headed off on a post-meeting field trip. Charm City’s been fun.